In this exclusive preview of Friday's episode of 'Hell's Kitchen,' Ramsay teaches aspiring chefs how to create a complex dish. 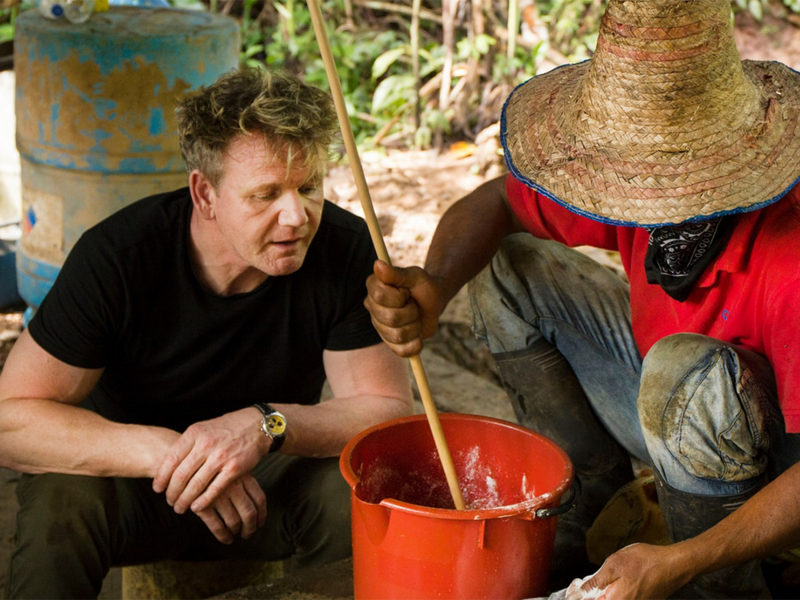 Gordon Ramsay is known for being so tough on chefs on his reality show cooking competition Hell’s Kitchen that it might sometimes be easy to forget that he’s actually an incredibly talented chef. His restaurants have 16 Michelin stars in total, so when he’s putting together his signature oyster dish—tagliatelle in an oyster shell, topped with caviar, the competitors on this season of the Hell’s Kitchen pay close attention. The chefs gather around Ramsay in a tight group as he moves with agile precision between burners, first pouring champagne over the oysters for the “most the amazing oyster juice,” careful to not overcook the cucumber garnish in another pot, and finally spinning the cooked pasta—in yet another pot—around a fork, which he drops, in elegant swirls, into the oysters. All the while, he’s shouting quiz questions at the assembled group (What happens to the cucumber if it’s overcooked? It gets mushy) as they try to take in each step of the process, sure that they’ll be asked to recreate the dish. Once Ramsay finishes creating his version—which is, of course, magnificent—he demands that the chefs line up at the kitchen counter, telling them, in an extremely ominous tenor, that he can only pay attention to those of them that are performing “at the highest level,” which means it’s time for him to “trim the fat.” Thus begins the “Fight for Your Life” challenge, in which the three weakest chefs from each team must cook their own version of Ramsay’s Tagliatelle with Oysters. How will the anxious chefs perform when tasked with cooking one of Ramsay’s most famous creations? Do they fail miserably and get an epic takedown from Ramsay? And who will end up getting eliminated from the competition when he “trims the fat” from his exclusive kitchen? You’ll just have to tune in to Fox tomorrow night at 8 to find out the chefs’ fate.